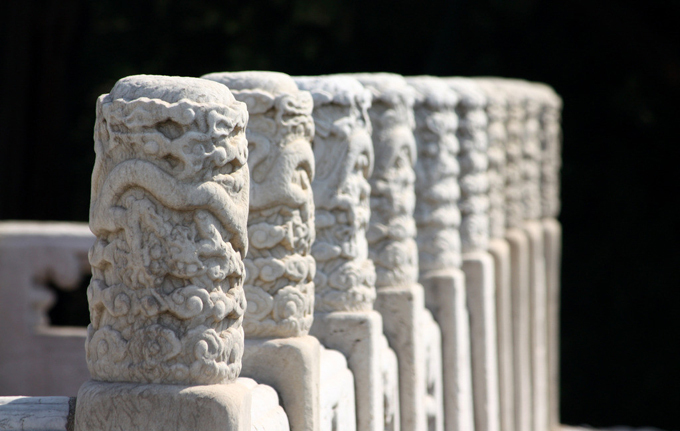 Most ethic groups in China worship their own deities. Thus the Chinese emperor was always very busy, since there were numerous gods that he had to pay respects to and be blessed by. As an emperor of the Qing dynasty, the deity of highest import that the emperor should pay most attention to worshipping was the God of the Sun, because “without the sun there can be no life”. The Ming emperor Yongle, who built the Purple Forbidden City, also decided to build a temple to worship Heaven and pray for a good harvest. 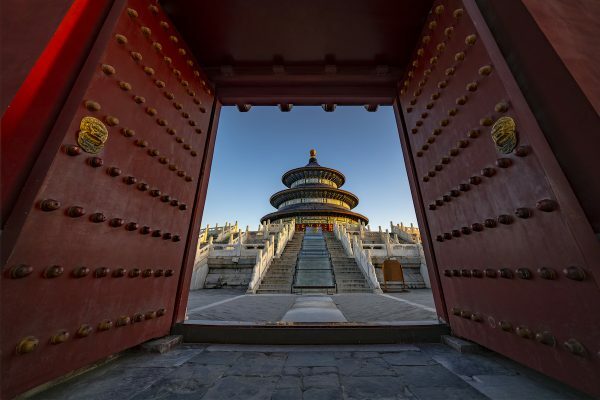 In the Temple of Heaven the wall that stretches from east to west is 1,700 metres long, and the one that stretches from north to south is 1,600 metres long. The two major structures used in sacrifices are circular in design and they supposedly correspond to the shape of heaven. 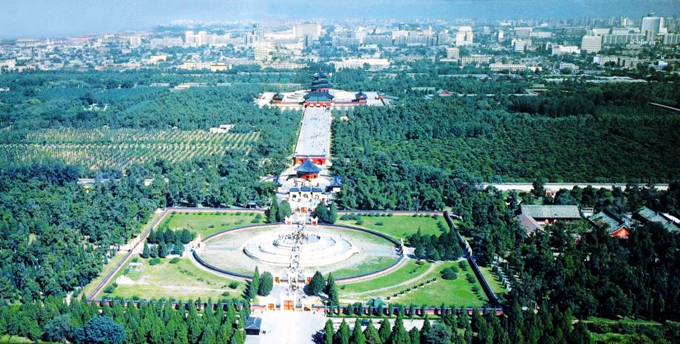 During the Ming and Qing dynasties, the emperors came here twice a year to worship – once on the 15th of January and once during the winter solstice (according to the Chinese lunar calendar). Before the Temple of Earth was built in the north of Beijing in 1530, this temple was used to worship both Heaven and Earth. How did the emperor worship and offer sacrifices to the God of Heaven? Before the ceremony, the emperor would put on special clothes and a hat made specifically for the ritual, and then he would fast for two days in the Hall of Abstinence (one of the buildings in the compound). When the emperor left the Hall of Abstinence, the bells would start ringing and would continue to ring until he arrived at the altar. Ovens were lit and the sacrificial ox was roasted. The emperor then led the military officers and civil officials to the altar and together they offered the sacrifices. The emperor looked up to the sky (heaven) to talk to the God of Heaven, then ceremonial music and dance would follow. The Hall of Prayer for Good Harvests, originally named the Great Sacrificial Hall, is at the centre of the compound. The hall is a lofty cone-shaped structure with triple eaves, and a gilded ball on the top. The roof is made of blue glazed tiles to imitate the colour of the sky. The base of the building is a triple-tiered circular stone terrace, which is constructed from slabs of white marble. The hall’s inner framework is also splendid to behold. Without using steel, cement, nails, big beams or even crossbeams, the entire structure is supported by 28 wooden pillars and a number of bars, joints, laths and rafters. 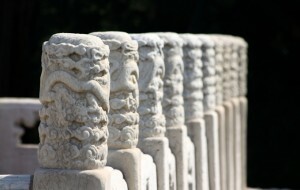 There are four central pillars named the Dragon-Well Pillars. Each of them has such a large girth that it would take two and a half men to encircle one of them with their arms. At a distance, the Imperial Vault of Heaven looks like a blue umbrella. 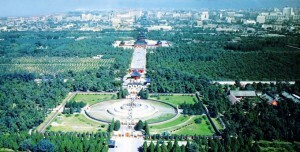 It served as the storehouse for the spirit tablet of the Supreme Ruler of the Universe. A famous round wall encircles this building, which is called the Echo Wall. A mere whisper at any point close to it will send the sound down along the wall so that the echo can be heard clearly at the other end. In front of the steps leading down from the hall you’ll find the Triple-Sound Stones. If you stand on the first stone and call out, the sound will be echoed once; on the second stone, the sound will be echoed twice; and, on the third stone, the sound will be repeated back to you three times. The Circular Mound Altar, made wholly from white marble, stands to the south of the Echo Wall. There is a square wall outside and a round wall inside, which together enclose the altar. The top platform is 33.3 metres in diameter and there is a circular stone in the centre, which was considered the most sacred spot in Ancient China. The middle platform is 50 metres in diameter and the bottom platform is 70 metres in diameter. 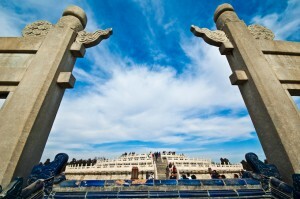 Each of these three platforms has four entrances and consists of three tiers, making a total number of nine tiers, which is significant seeing as the number 9 symbolises Heaven in Han culture.